It’s long been known that berries are good for our health. This is in part thanks to the potent antioxidants that are found in the form of specific phytochemicals in the dark red, blue and purple pigments of these fruits. Growing evidence has shown that these phytochemicals, called anthocyanins, can aid in protecting the body against numerous diseases like cardiovascular disease, diabetes and cancer. One such study looked at the effect of anthocyanins on molecular pathways and the outcome this has on enzymes implicated in cancer. The study showed that one type of anthocyanin, known as cyanidin – which is found in wild bilberry, raspberry and cranberry – appears to reduce the activity of cancer-causing genes while boosting the activity of cancer-stopping genes. Preheat the oven to 180˚C. Line a baking sheet with baking paper and set aside until needed. Combine the almond and coconut flour, xylitol, baking powder, psyllium husk powder and salt together in a medium bowl. Whisk to remove any lumps. Set aside. In a separate bowl, whisk the soya milk, avocado oil, 2 beaten eggs and vanilla essence together. Add this mixture to the bowl of dry ingredients and mix with a wooden spoon until well combined. Tip the dough out onto a generously floured, clean work surface. Using a rolling pin dusted with flour, gently roll the dough out to 1cm in thickness. Use a 6cm round cookie cutter to cut 12 discs out of the dough. Transfer the discs to the prepared baking tray as you go. Brush the discs with the beaten egg and bake in the preheated oven until golden brown, about 15 – 20 minutes. 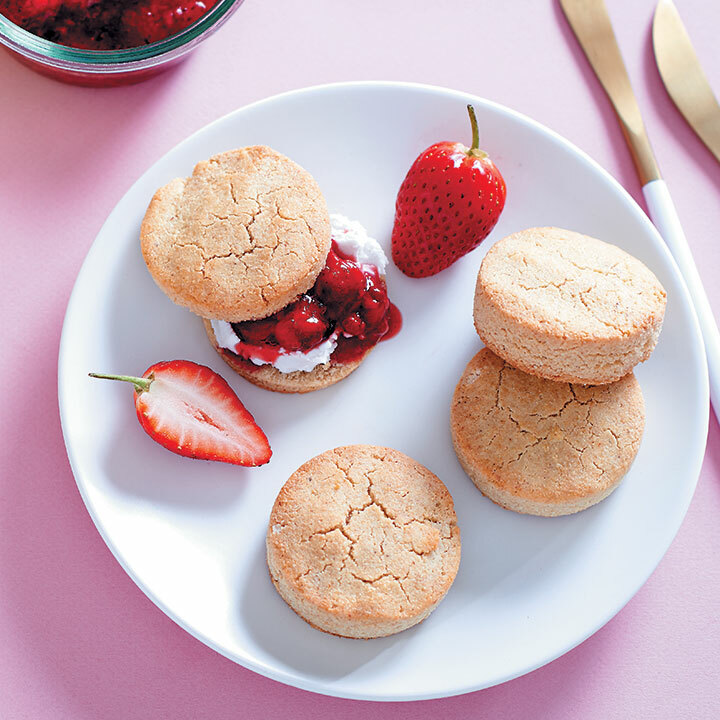 Serve the scones warm, with the cottage cheese, mashed berries and strawberries alongside.